• Security System: Naturally, this is the most practical place to start if you’re concerned about the safety of your home and family. You’ll want a system that can be monitored and controlled remotely (most support this capability) by you and a professional monitoring service, is easy to use for every member of the family, and is compatible with other types of home technology systems, like lighting control systems and heating and cooling systems. • Electronic Door Lock: Requiring no keys, these locks are particularly helpful to parents of latchkey kids. The door can be opened by punching in a secret passcode, which you set up and can change at any time. You can receive a ping on your smartphone when the lock is disengaged so that you know the second your kids are home from school. And if they forget to lock the house back up, you can handle it right from a smartphone app. • Surveillance Camera: Seeing is believing, and there’s no better way to keep tabs on the happenings in and around your house than with an Internet-connected surveillance camera. Look for one with an integrated motion sensor and microphone. The motion sensor tells the camera to snap and send a picture to your smartphone; the microphone lets you speak with whoever triggered the motion sensor. • Whole-House Entertainment System: Having a killer sound system and video setup in a single area of your house is one thing—being able to spread all of that wonderful entertainment content to several rooms of your house is quite another. Choose a system that supports the number of entertainment areas you envision and the number of components you own or plan to own (plus leaves growing room for additional rooms and components). Also, keep in mind that some systems require the additional of low-voltage wiring, while others distribute signals wirelessly—plan accordingly. • Home Theater: Owning a home theater is the ultimate in high-tech fun, but it’s not just the stellar video and audio that makes a home theater a delightful addition to your home. The process of designing one can actually be fun, too. In addition to a video projector, screen and surround-sound system, you can incorporate motion simulators underneath the seats, twinkling fiber optic stars on the ceiling, and illuminated marquees, and unique touches. 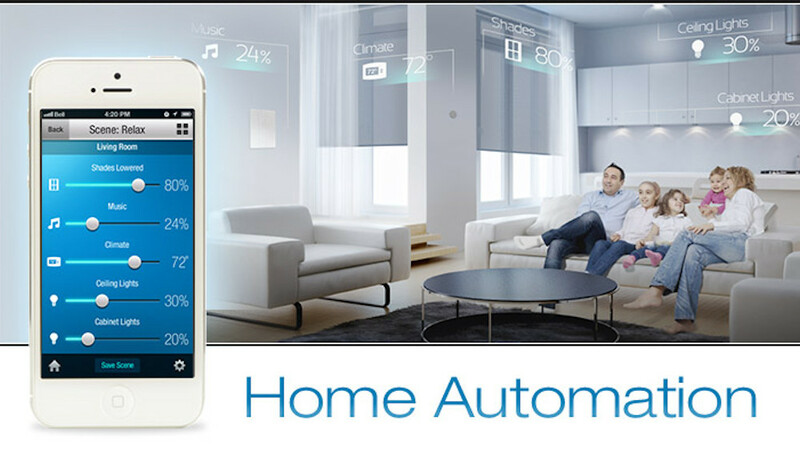 • Integrated Home Control: The beauty of a home control system is its ability to make individual technologies perform in unison. While this feature in and of itself might not be what most would consider fun, it definitely inspires fun by enabling you to prepare your house at the touch of a button for an impromptu gathering of friends, an elaborate dinner party, a birthday celebration, the Super Bowl, the holidays … really any occasion you can think of. In an instant, the lights, the music, the temperature, and the TVs are ready for whatever fun-filled activity you have planned. • Networking System: There are two types of networking systems: hardwired and wireless, and each contribute largely to functionality of the technologies you’ve chosen to add to your home, be it a whole-house entertainment system or a security system. Commands issued to smart home systems from smartphones, tablets, keypads, touchpanels, handheld remotes, and other devices need to reach their intended destinations with no hiccups during travel, and the only way to ensure that this happens is with a robust, reliable home network. • Lighting and Shading Controls: Often deemed the cornerstones of a smart house, being able to conveniently control lights and motorized windows shades makes your home so much easier to manage, not to mention helps save electricity and enhances comfort. Like most smart home systems, lighting control systems and motorized shading come in both hardwired and wireless varieties, and can focus on one room or the entire house. Our advice: choose a system that’s affordable and easy to install into your home, yet can be expanded and updated when you’re ready. • Smart Thermostat: Everyone wants to feel comfortable at home, and this boils down to the thermostat on the wall. It determines how and when your home’s HVAC unit operates, and if that thermostat is difficult to deal with … well, your HVAC will probably have a difficult time delivering the perfect indoor climate. Swapping your old dumb thermostat for a new smart one is an easy, affordable update that makes your HVAC system function efficiently without sacrificing any of your comfort. Today’s thermostats are being designed with all sorts of cool features, like the ability to learn your heating and cooling habits, report weather conditions, control air cleaners and ventilation systems, and more, so investigate thoroughly before choosing one for your house.